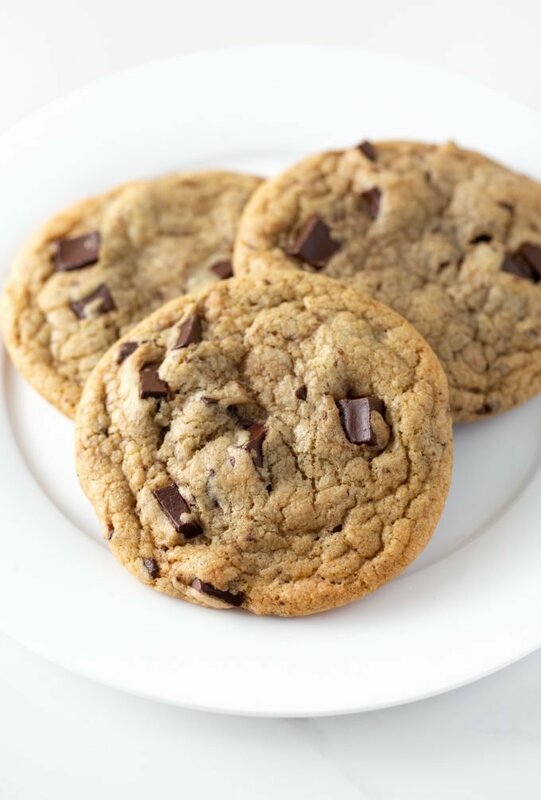 Replicate the famous Panera Chocolate Chip Cookies at home in under 30 minutes! 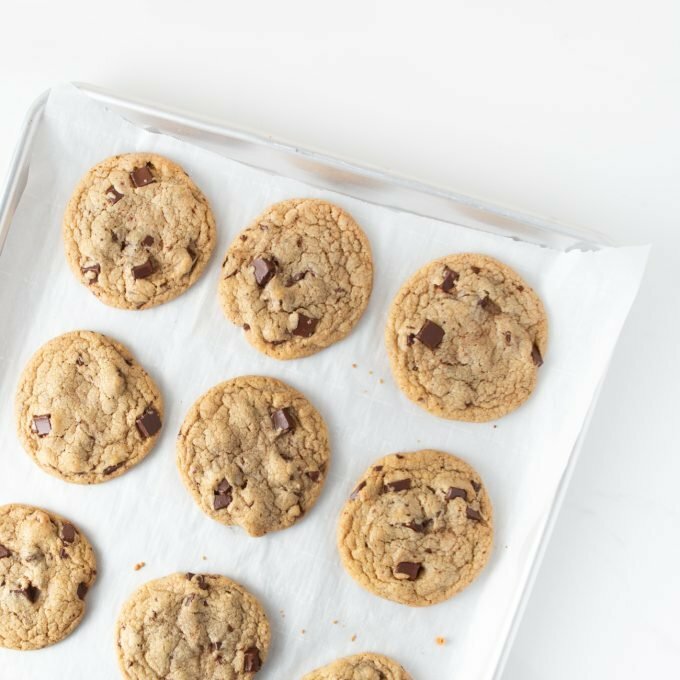 No mixer, softened butter, or chilled dough needed – just a bowl and spatula and you’re on your way to soft, warm, melt-in-your-mouth cookies. 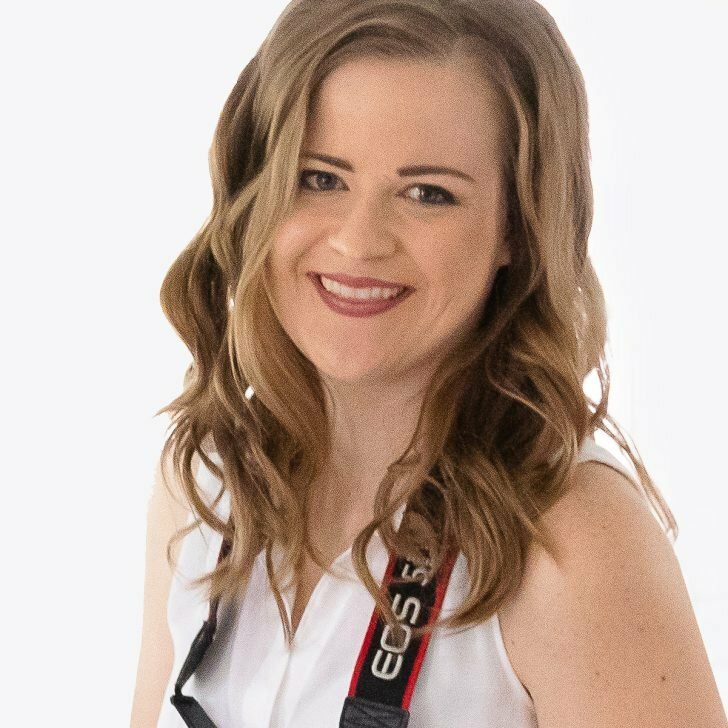 Back when I lived in Iowa, I’d occasionally drive 20 minutes to the nearest “city” and plant myself at Panera to get some work done (the wifi was horrible, but it was the only option before Starbucks!). In that time, I was introduced to their chocolate chip cookies and it wasn’t long before I developed a love/hate relationship with them. Some days they were fresh, soft, warm, and amazing while other days they were clearly a few days old, a little stale, and hard. But oh man, when they were fresh and warm, DANG they were good. 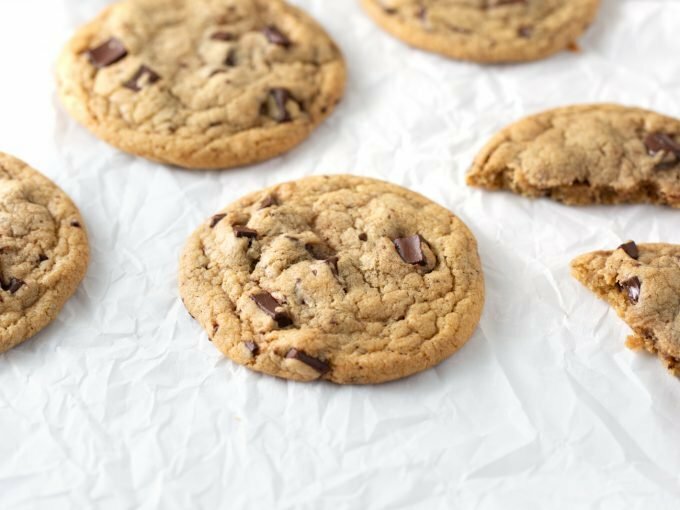 What makes these copycat Panera chocolate chip cookies so great? You don’t have to soften the butter. 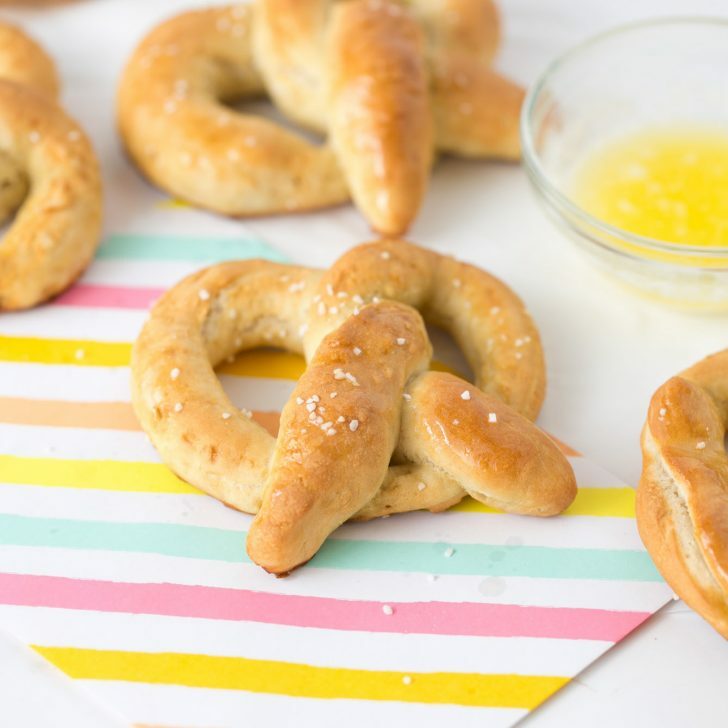 This recipe uses melted butter which means you can make them on the spot when the craving hits. 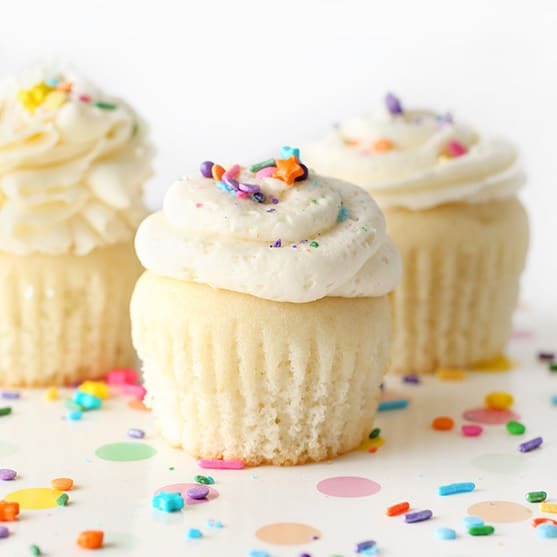 You don’t need a mixer and actually you should NOT use one. All you need is a bowl and spatula. You don’t need to chill the dough. Because the last thing I want to do is wait 2 hours to make cookies. This recipe makes 10-12 large bakery style cookies, which means you only need to bake 1 tray. They’re perfect for gifting (more on that later). 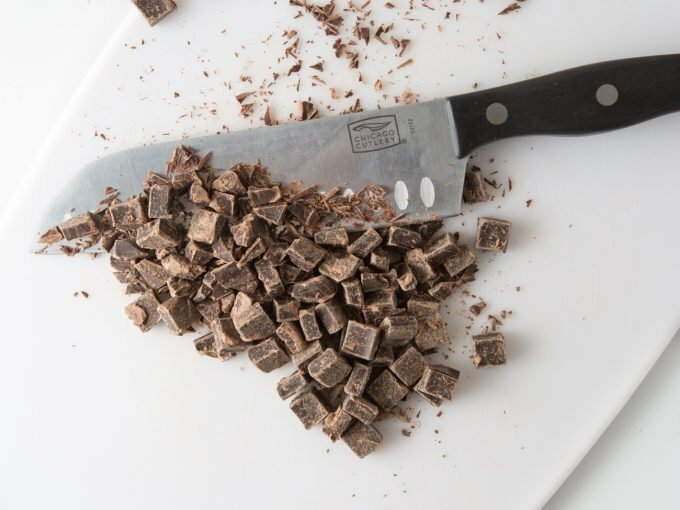 Use a sharp knife to chop 1/2 cup of the chocolate chunks into small shards and slivers (set the other 1/2 cup of unchopped chunks aside). Set aside. In a small microwave-safe bowl, melt the butter for 20-30 seconds until JUST melted (you don’t want it piping hot). Add in white sugar and brown sugar and use a spatula to stir until combined. Mix in egg. Next, add in baking soda, baking powder, and salt and mix again. Add flour and mix until all the flour disappears into the dough. Lastly, add the 1/2 cup of chopped chunks and 1/2 cup of whole chunks into the dough and mix. Immediately proceed to scooping (you don’t want the dough sitting out or it will harden). Line a baking sheet with parchment paper. 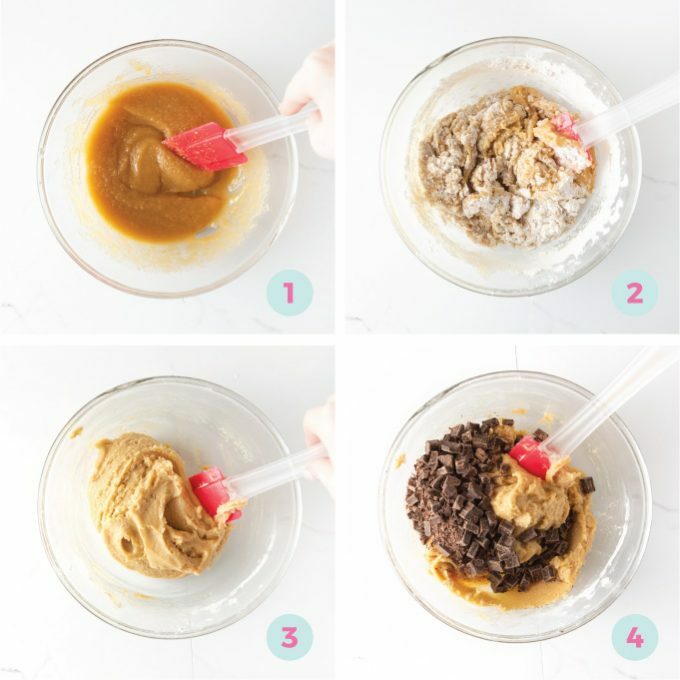 Scoop dough into 3-tablespoon sized scoops then gently roll into your hands to create a ball. Slightly flatten the tops so that they’re a thick disc vs. a round ball (see image below). Tip: If you notice 2-3 chocolate chunks are stuck together, separate them before baking. This will allow the chocolate to be evenly dispersed and prevent the cookie from having a giant clump of chocolate in one spot..
Bake at 350 degrees for 10-12 minutes. You want them to be slightly brown on top and look slightly underbaked (my oven was perfect at 11 minutes). Remove from oven and place entire pan on a cooling rack. 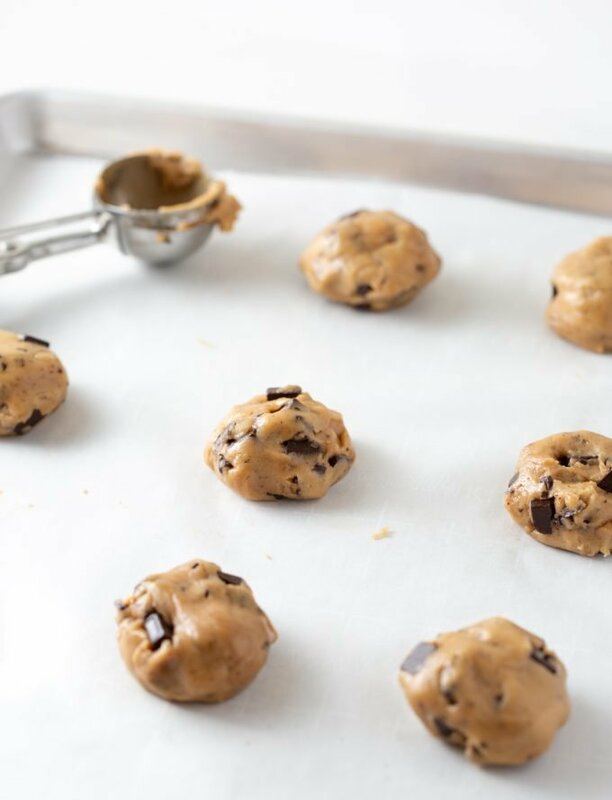 Allow the cookies to cool on the hot pan for 10-15 minutes before removing them. This will allow them to finish baking on the hot pan. Once cooled, use a spatula to transfer them to a wire cooling rack. Do I have to chop half the chocolate chunks? Yes, you do. 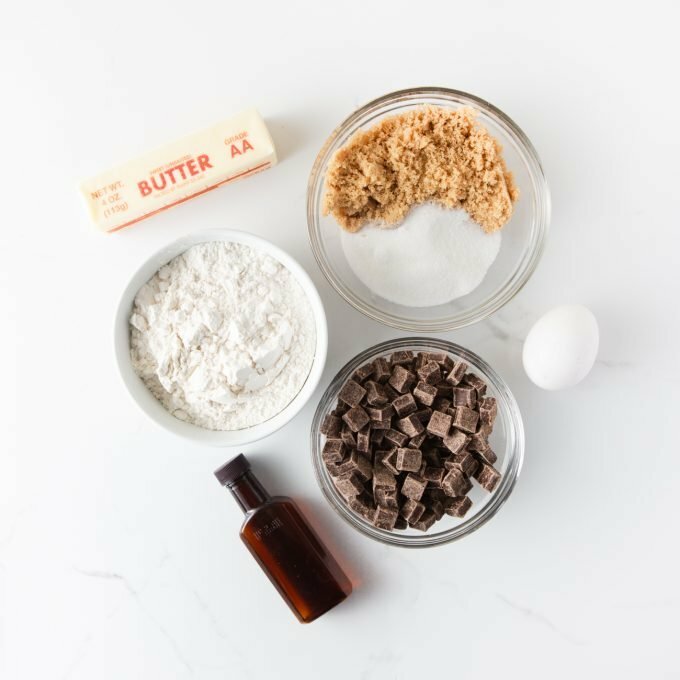 If you truly want them to be like Panera chocolate chip cookies, then take the extra 1 minute and just do it ;) Having this mix of chopped and whole chunks allows for the chocolate to be evenly dispersed. So here’s the thing. If you’re truly looking to replicate Panera cookies, you need the chunks. 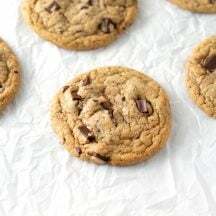 I tested this recipe with chocolate chips and they weren’t the same because most brands of chocolate chips don’t melt down as well as chunks (and therefore the cookies are not as thin). 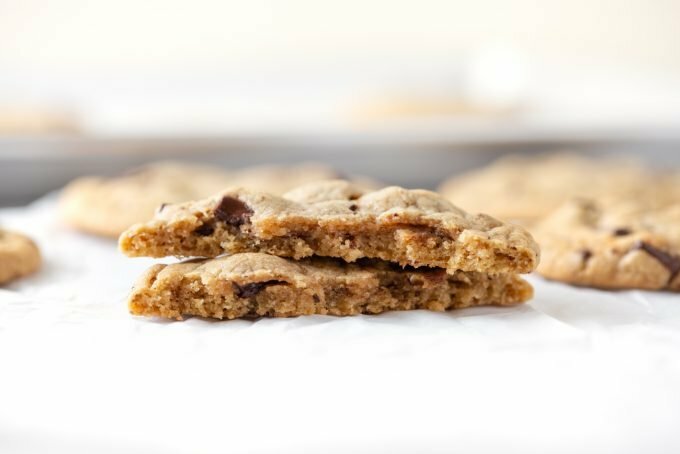 If you use chocolate chips, it will still result in a good chocolate chip cookie but it may not turn out the same as the traditional Panera cookie. That said, if you do use chocolate chips, make sure you are still chopping half of them so that the dough has an even dispersion of chocolate. How big will these be? If you follow the instructions and use a 3-tablespoon sized scoop, your cookies should end up being around 3.5 inches. This can vary depending on your altitude and climate, but that’s how big mine spread in Tennessee. This is not a diet recipe and these nutritional facts are just estimates. But the Panera website lists their Chocolate Chipper Cookie at 380 calories. 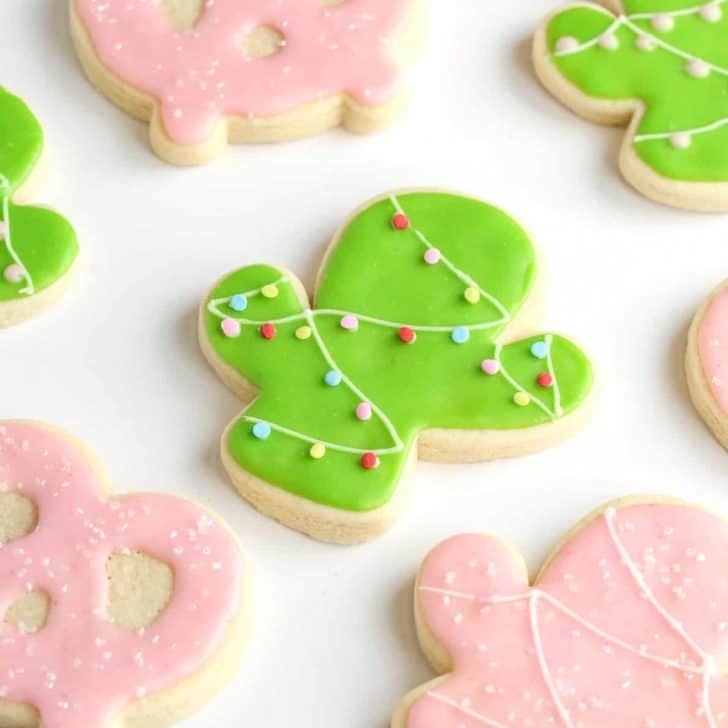 If you make 12 of these cookies, they’ll come in around 260 calories/each. Any ideas to gift chocolate chip cookies? Of course I do! 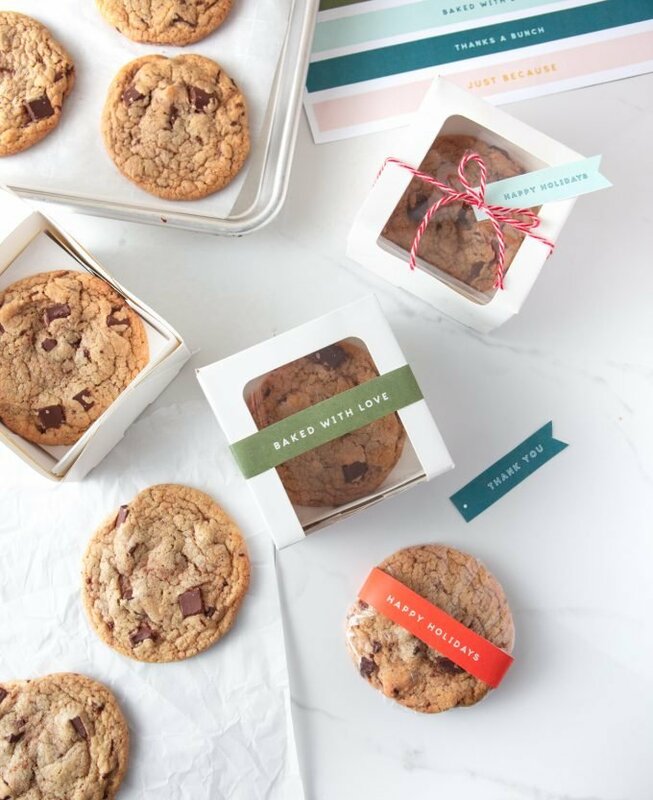 Gift cookies in single cookie boxes with printable cookie wraps and tags (as seen below, coming soon! 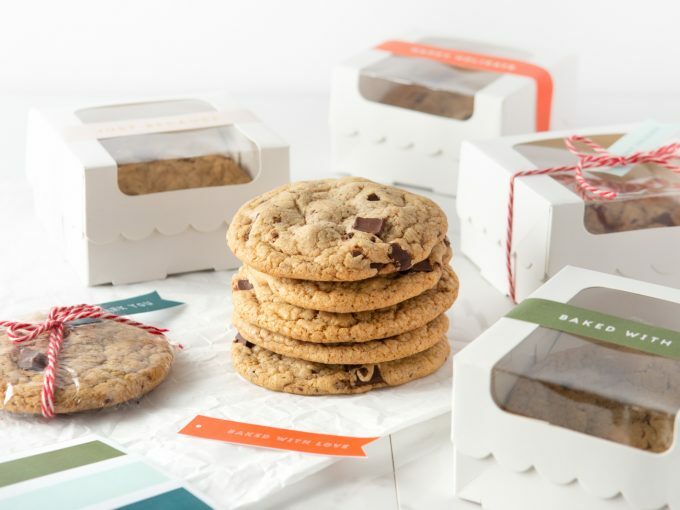 ), gift in cellophane bags with a printable cookie tag or wrap them in plastic wrap and slip in my chocolate chip cookie bags. Replicate the famous Panera Chocolate Chip Cookies at home in under 30 minutes! No mixer, softened butter, or chilled dough needed - just a bowl and spatula and you're on your way to soft, warm, melt-in-your-mouth cookies. 1 cup dark chocolate chunks (You'll be chopping 1/2 cup and adding the remaining 1/2 cup whole). I used Kroger brand "Private Selection Dark Chocolate Chunks" and have found them to be the most authentic to the Panera kind. Use a sharp knife to chop 1/2 cup of the chocolate chunks into small shards and slivers (Note: only chop HALF of the chunks - not the full cup we'll be adding). Set aside. 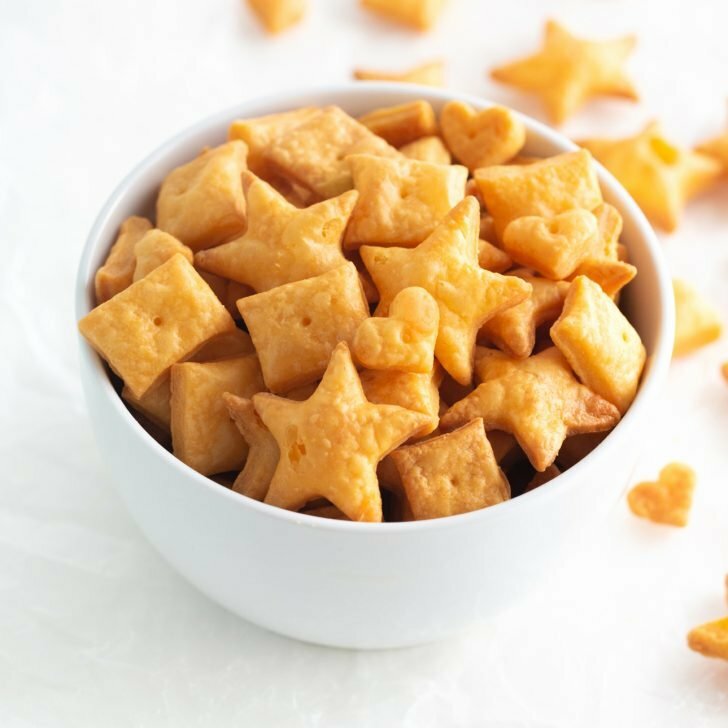 In a small microwave-safe bowl, melt the butter for 20-30 seconds until JUST melted. Add in white sugar and brown sugar and use a spatula to stir until combined (* do not use a mixer for this recipe). Add in egg and mix. Next, add in baking soda, baking powder, and salt and mix again. Add in flour and mix until all the flour disappears into the dough. Add the 1/2 cup of chopped chunks and 1/2 cup of whole chunks into the dough and mix. Immediately proceed to scooping (you don't want the dough sitting out or it will harden). Line a baking sheet with parchment paper. Scoop dough into 3-tablespoon sized scoops then gently roll into your hands to create a ball. Slightly flatten the tops so that they're a thick disc vs. a round ball. See image in post for reference. 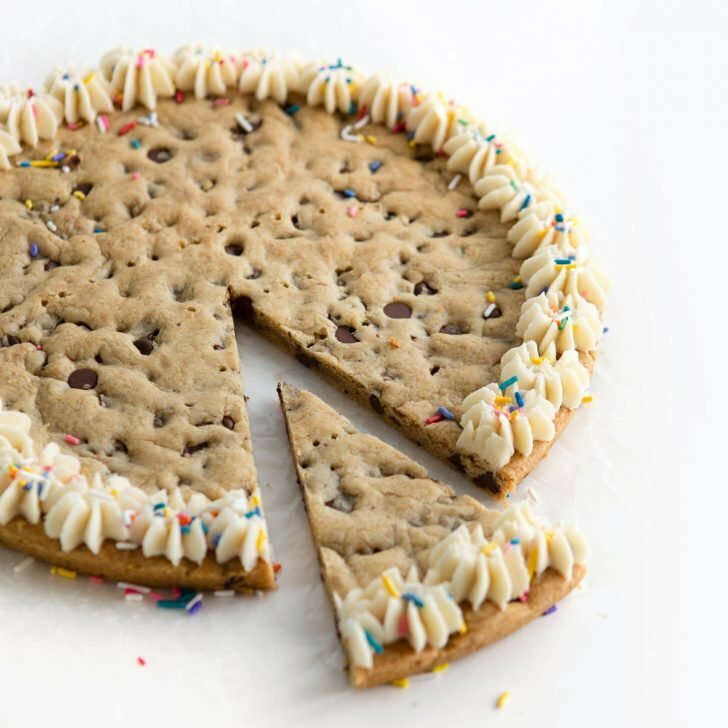 Without flattening, your cookies will be thicker and more cakey. Bake at 350 degrees for 10-12 minutes. You want them to be slightly brown on top and look slightly underbaked (my oven was perfect at 11 minutes). Remove from oven and place entire pan on a cooling rack. Allow the cookies to cool on the hot pan for 10-15 minutes before removing them. This will allow them to finish baking on the hot pan. Once cooled, use a spatula to transfer them to a wire cooling rack. 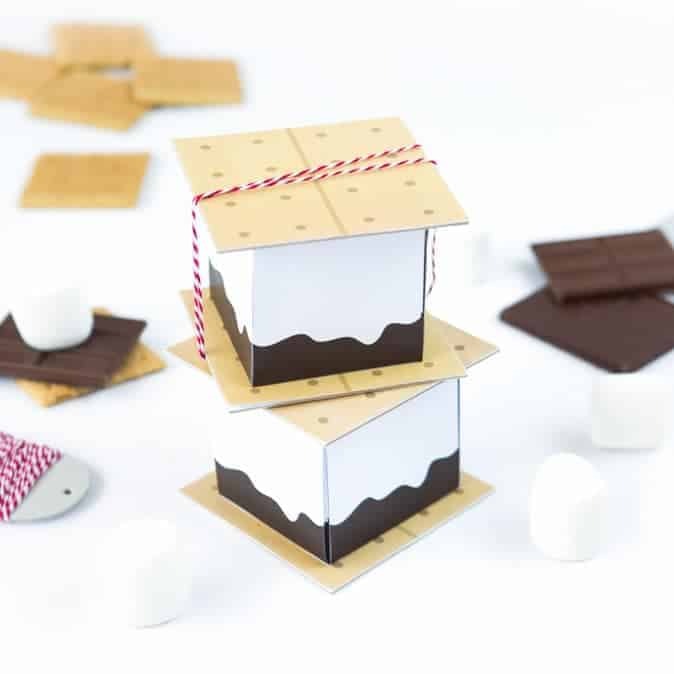 Gift in single cookie boxes with my printable cookie wraps and tags! 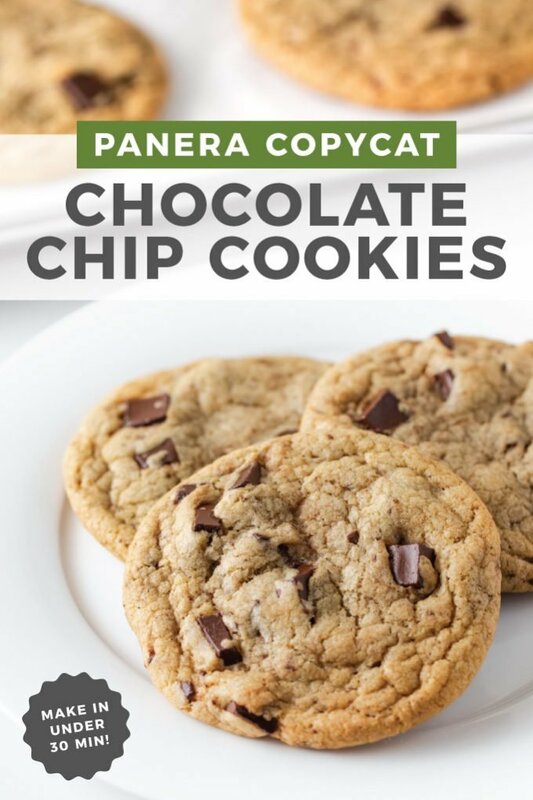 Have you tried the Panera chocolate chip cookie? If so, you have to try this homemade version! If you end up making it, be sure to leave a comment or tag me on Instagram with how you liked them!